Officials in Jeffersonville broke ground on a three-story, 93-room Marriott TownePlace Suites across from the Big Four Bridge last week. 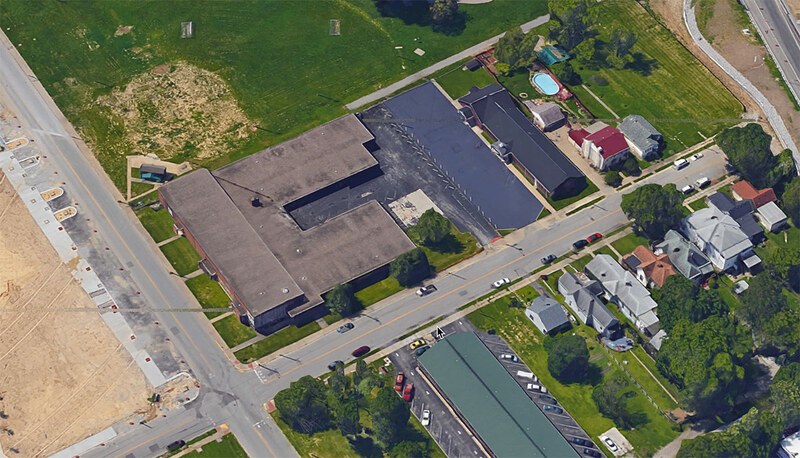 The hotel is located on the corner of Mulberry Street and Maple Street on the 1.3-acre site of the former Rose Hill Elementary School. The developer, ARC, and hotel partner, Dora Hotel Company, expect the 56,000-square-foot project to be complete by the beginning of April 2017, according to the News & Tribune. When we last wrote about the project in March, developers had planned a small retail section on the corner, but those plans have been removed in the final design. Developers opted instead for more guest common space and an indoor pool rather than retail, despite being directly across the street from the wildly popular Big Four Station park. The design of the L-shaped structure has changed slightly as well, with a greater color differentiation of a series of false facades meant to evoke the scale of urban buildings found in downtown Jeffersonville. Developers took input from neighbors on what those facades should look like. Ultimately, other developments attempting this faux-facade aesthetic have failed to create a believable final product. Especially when retail, a common element to such urban buildings, is missing. Sidewalks also remain an issue at the site. Ninety-degree parking adds a few additional spaces, but forces pedestrians to walk in a zig-zag fashion around the parked cars. The project is being touted as a public-private partnership and has been funded in part by tax breaks. It seems with such a prominent site, however, that Jeffersonville could have requested a slightly more amenity-rich project. Plans for the property date back three years when ARC purchased the old school building, then converted into affordable housing on a weekly basis for men. Initial plans called for residences, but plans changed when Jeffersonville sought to develop a park next door into townhouses.